Beverage Wholesaler - January 21, 2019 To view this email as a web page, click here. No question about it: American whiskey is in a new golden era. Category sales have reached heights unseen since the 1960s, the last time brown spirits boomed. But that prior golden period came before the whiskey swoon of the ‘70s and ‘80s. Should we expect another decline coming soon? Southern Glazer’s Wine & Spirits has expanded its distribution agreements with French winemaker Gérard Bertrand to five additional markets in the U.S.
With this expansion, Southern Glazer’s will now distribute Gérard Bertrand’s portfolio of wines in 33 U.S. markets. The agreement was effective January 1, 2019. 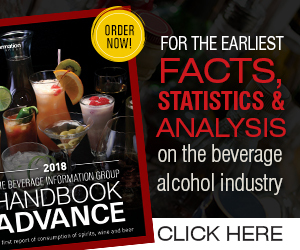 The Beverage Information Group is currently collecting 2018 sales data for determining its Growth Brands Awards. All wine and spirit brands are eligible by submitting their 2018 case sales (9-liter). For more information, please contact researcher Marina Velez at mvelez@epgmediallc.com or visit BeverageDynamics.com/growthbrands. Requirements: Supporting Sales Reps and Sales Managers in delivering specialized services to outlets by being fully versed in a divisions Portfolio (DIAGEO, NOLETS, MHUSA), to include hand selling on our luxury portfolio, education in spirits for On Premise accounts, trade event development/management, menu consulting, sampling, social media and driving the overall success of major trade initiatives.